It’s best to start this review by saying that the HP EX490 is not your average NAS backup device. The HP has far more going for it than a small NAS device that sits next to your router to backup a few documents. 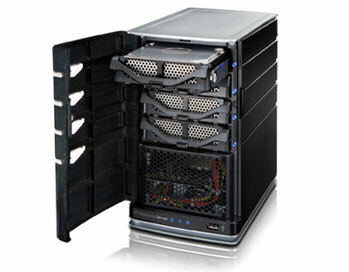 While the size of the MediaSmart Home Server may be a bit big for some (it’s about the size of a mini desktop computer tower), the power within is well worth the price and extra space it takes up when it comes to networking your hard drive space and making sure your home media needs are taken care of and your documents are safe and secure. The first noticeable difference between the MediaSmart and other NAS devices on the market is what’s under the hood. The HP has an Intel Celeron Processor and 2GB of RAM powering the main computing processes, which is more than enough to guarantee that you’ll be able to stream all of your media across the network without any glitches or lag time for any of the computers looking for files. It’s this type of power that should come standard on NAS devices but doesn’t. Also coming standard with the device is a 1 TB hard drive that spins at 7200 RPM, much faster than most storage drives. And because the machine is expandable up to 17TB of space (Yes, we said 17TB of space), all of that extra processing power will come in handy as you’re transferring files all over the place. It’s important not to forget that the MediaSmart is also a home server, not just a NAS device. If you’re like most and have video files whose formats won’t play nice with other media playback devices in your home, such as mobile devices, HP included built-in transcoding software into the server. The transcoding software allows you to convert video file formats to and from different codecs and containers so that different devices can make use of the video file. And because the software is installed on your server and not your home PC, you can free up the computing power from your desktop and pass the load off onto the server to convert those video files that you want to watch. Despite its size, this server doesn’t use much power at all. On average, you’ll burn through a few watts an hour (read: about 50). For those of you trying to figure out how much extra that will cost, you can pull out your last energy bill and see how much your energy company charges per kilowatt hour, or 1000 watts of power used. Chances are, it won’t be much. 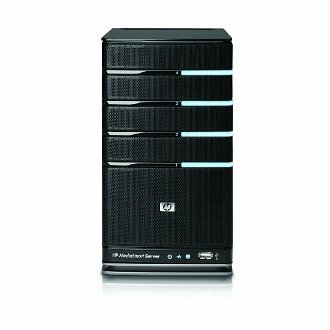 We really love this HP MediaSmart Home Server. The 1TB of space really wasn’t enough out of the box considering how much potential this thing has, so we recommend throwing a few extra drives in there to make use of all of those drive bays. Remember, it’s biggest selling point is that it can be expandable up to 17TB. For the technically inclined, it’s possible to upgrade the CPU in this to get even more punch out of it, but it isn’t required to get fast speeds for transcoding and delivering files. This product gets two thumbs up from us and we say go for it.